One thing that I cringe to spend a lot of money on is maternity clothes. You only wear them for a short amount of time before you’re working to get back into your old clothes. 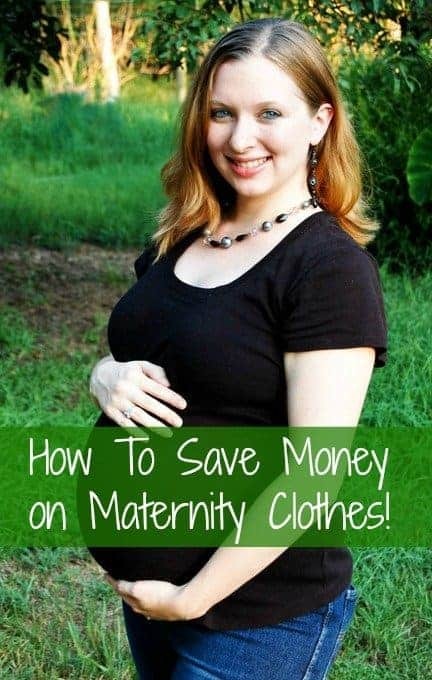 I knew I had to find out how to save money on maternity clothes for my pregnancies. Doesn’t everyone love some great pregnancy tips, especially when it comes to maternity clothes? I’ve figured out some ways to snag some cute clothes and not spend an arm and a leg. Keep in mind, I’m a jeans and t-shirt kind of girl for the most part, but I do like to wear a dress or skirt every now and then. Here are my tips for snagging cute, comfy maternity clothes on the cheap! A large portion of my maternity clothes have come from eBay. The way to score maternity clothes for cheap on eBay is to buy the clothes in lots. You will often find that when women are done having babies they will try to sell a large portion of their maternity clothes wardrobe on eBay. If you know you are going to spend most of your pregnancy during the winter, you could simply type in the search bar “winter maternity clothes lot medium” and find several listings. Some sellers do sell all new clothes in lots like this, but obviously the prices will be higher than if they are pre-owned. Make sure you check how much the seller wants for shipping. Sometimes when the bids start out really low, the seller will charge in shipping what they want to make off of the lot. Make sure it’s a price you are comfortable paying. Regardless, this is a good way to get several pieces for less than you would pay in the department store. This tip may be obvious, but I love shopping the clearance racks at my favorite stores. Kohl’s sells Oh, Baby by Motherhood jeans. 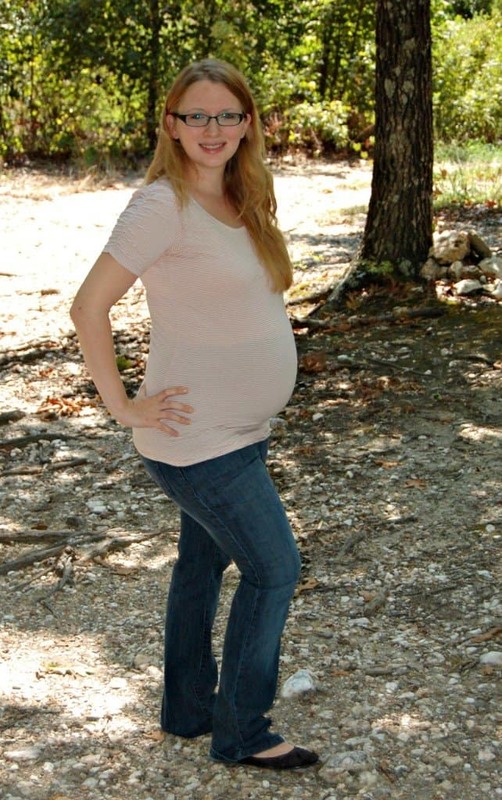 I love these maternity jeans. They have the secret fit belly and it is oh so comfortable. The thing is, the jeans are normally priced at $60.00! I’m a cheapo and would never pay $60 for a pair of jeans. I go straight to Kohl’s and can usually get them for $36 in the store. I bought one pair of these jeans and a pair of shorts with the secret fit belly and spent way less than I would have at the mall. Those two things are my favorite maternity pieces! I also save on shirts by shopping the clearance racks. I found out in March about my little one and knew I would be pregnant into November, so I stocked up on a couple of long-sleeved shirts and sweaters that I could wear at the end of my pregnancy. I paid between $3 and $5 for each top because they were out of season. This is my favorite maternity clothes tip. I needed some new shirts so I went to Target. I was browsing the maternity section and picked up a few basic t-shirts for around $12 a piece. Before I left, some signs in the regular clothing section caught my eye. They were running a sale on t-shirts for $6 each. If I had a coupon, I could have bought them for $3, but I digress. After seeing the price difference there was no way I was going to pay twice as much for some t-shirts, so I picked up some of the cheaper non-maternity t-shirts in a size larger than I normally buy. They still fit my big ol’ belly great! The dress in the picture of me above is one of my favorite dresses. It was given to me and is normally huge on me when I’m not pregnant. Instead of giving it away like I initially thought I would, I decided to dedicate it to my maternity wardrobe. Now I can wear it when I’m big and pregnant and going out on a date with my hubby! What are some of your tips for saving money on maternity clothes? Thanks! Yeah $30 is a little steep for a shirt you’ll only wear a couple of months! I love that pink dress! So cute! You look AMAZING in that dress! 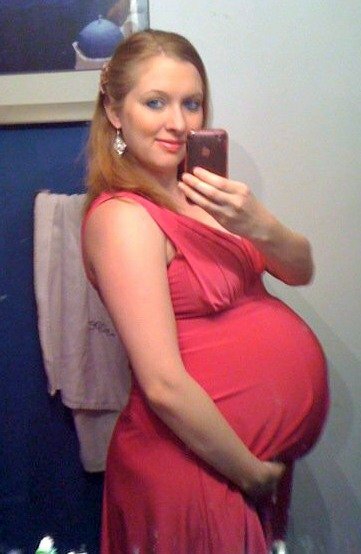 Great tips – my cousin found a beautiful maternity dress for a froo-froo baby shower for under $10. I never thought to do that when I was pregnant but I will if I am blessed with another! I saved a lot of money by wearing target tank tops – the Mossimo long and lean ones that aren’t actually for pregnancy but are super comfy and stretch over the belly really well. They were like $7 on sale and I wore them all the time and even after because they were easy to nurse in when I was at home. Pinning this – thanks! great tips…! this is very effective post about save moneyon the maternity clothes. I think we should try to follow the way saving money on the maternity clothes. many people dont have any idea about this. so this article was very effective and helpful to us. thanks for sharing the amazing way on the maternity clothes. This is an awesome post. Thank you so much for share this.! This article was so helpful. I am now 19th week pregnant and I am so excited about this. It is wonderful to connect around it. Thank you. Hi, You look amazing in that dress! great tips…! this is a very effective post about save money on the maternity clothes. Thanks for sharing the amazing way on the maternity clothes.